Last week I finished the last achievement tier of the Dark vs. Light event. I think it's too early to talk about how the event has gone as a whole, considering that it probably still has another month or two to go, but I figured it would be appropriate to talk about how it went for me. While I didn't receive the event's original announcement nearly as badly as some people, I wasn't super excited about it either. I acknowledged that it probably wasn't targeted at me as a veteran player and figured that while I would give it a try, it might not really draw me in. In practice however, I actually ended up loving it! 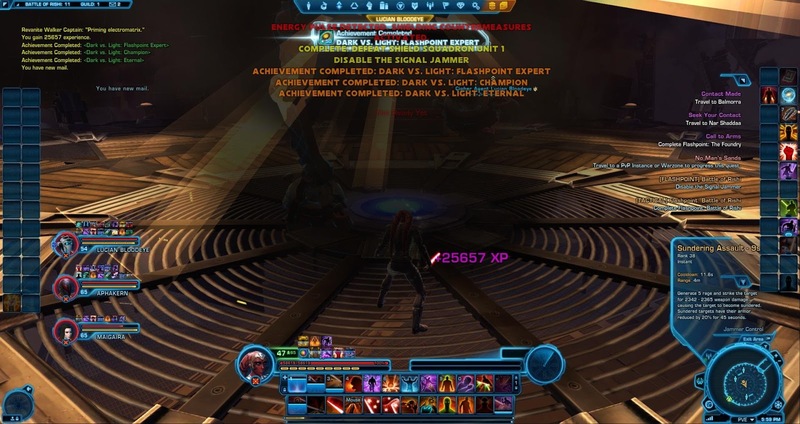 The Dark vs. Light event has kept me more engaged with the game over the past three months than I've been in a while, and guildies actually complained that it was hard to pry me away from my DvL alts to do anything else at times. 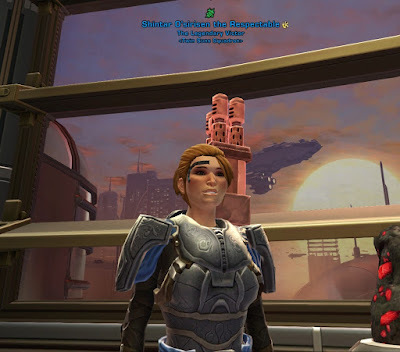 As expected, the only thing I found a bit "chore-like" was redoing all the KotFE chapters yet again, but I actually loved rolling new characters, levelling them, and dipping my toes into various pieces of content that I hadn't done for a while (such as the hardmode flashpoints). Bhagpuss wrote a post not too long ago in which he talked about how much he loves starting over from scratch, and I'm definitely in the same camp - I just enjoy endgame as well and it's way too easy to fall into a routine of using all your game time to raid or do PvP dailies or similar tasks. Having an actual incentive to go back and start over has been great. I guess it also helps that I'm someone who keeps all her characters fairly static, which is to say that I rarely change their appearance (gear excluded) or even their chosen discipline. Shintar has been a cyborg combat medic with a blonde ponytail since the day she was created. This means that even just choosing a different look and spec for a new character of a class I already have results in what to me feels like a very different experience. As someone who usually loves to play healers, I did a lot of experimenting with dps specs on my event characters, and it certainly broadened my horizons and increased my understanding of why players of those specs often act in a certain way. Now that I'm done with the event, I actually almost feel at a bit of a loss as for what to do next. I've started by picking up some alts that had been stagnating in levelling limbo and by getting back into PvP in the evenings. Since the event still has some time to go, I even considered starting over on another server! I think that might be edging just a bit too close to crazy though. Plus there are also other games that I've neglected. 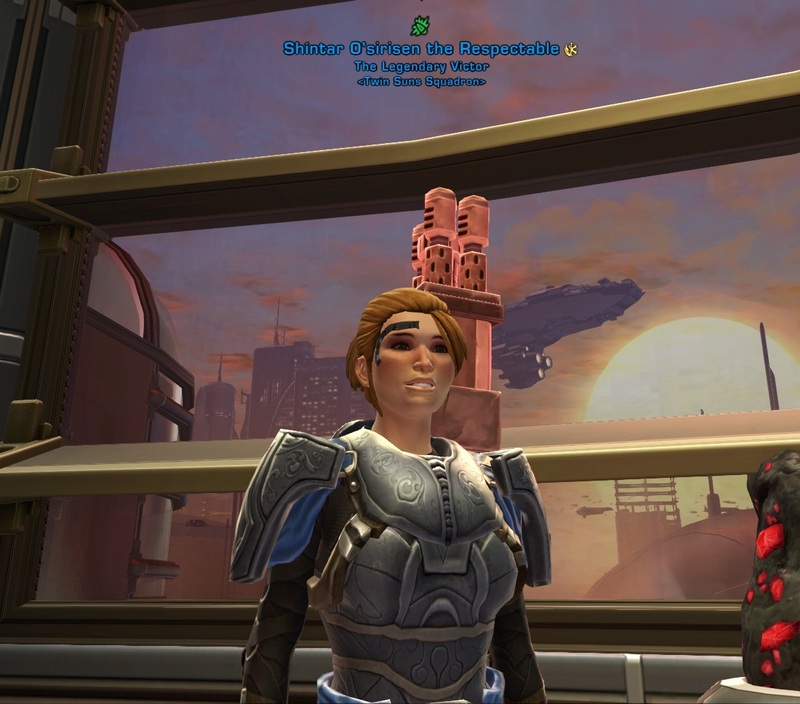 Oh, and in case you're curious, I did end up getting Battle of Rishi as a random tactical after all, though my last event character was already in the high forties at the time. I actually yelled out loud in excitement when I saw what I'd got! So that completed Champion and Eternal tier for me, and a few days later I got Legendary when my warrior hit fifty. The item rewards from the boxes were hit and miss (there's just no way I need four copies of the same blaster pistol), but I did get a couple of nice chest pieces that I could see myself using on one of my next alts - after bingeing on alt creation for the last three months however, I think it's probably going to be a while until I roll up another one (on The Red Eclipse anyway). I also have the urge to roll some characters on a new server and see what I can get, but I'm resisting that to not serve my obsessive (read: crazy) side. I went as far as the penultimate tier and have now officially stopped. That was grindy enough for me. I just couldn't face leveling another six characters (never mind having to fork out real-world cash for all those extra character slots). The crafting skills requirement made me shiver too. Doing all those HM Flashpoints is god awful and after subbed/playing since Beta, it was a game breaker. I personally did everything else on the event (rest of the guild wasn't feeling it), but having to do all those flashpoints all over again, after doing them so many mind numbing times in the past; MOREOVER, the 3.0 flashpoints are too ridiculous. My whole Beta guild quit the game completely, it all got too old; and the last chapter ended lousy. Too burnt out to return to the game, and unenthused about new trailer - it was very 'meh' plot-wise. How Much RNG Can We Take? 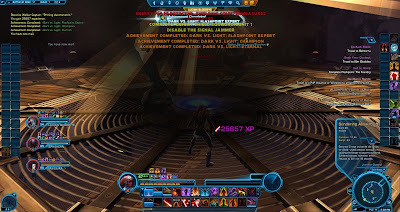 KOTOR Adventures: Leave My Wookiee Alone!